I was recently email intro-ed to Lexi because she was asking her friend and CG reader Laurie how best to age some gummis. Lexi needed these particular gummis to be less soft and more firm. Laurie, Jonny, Lexi and I started in on a 63-email exchange on various things sweet and part of that conversation went into sour balls. (I already did all the bawdy jokes in this Goofy’s Balls review so go there if you need an irreverent chuckle). Lexi wondered if we liked the ones from Jelly Belly, called Fruit Sours , which she thought were once created by Goelitz and that she loves but couldn’t find anywhere except online and in 10 lb. increments. Back story out of the way, let me say right off the bat that these things should be called Tarty Balls. First reason is that name would make me giggle. Secondly, these balls aren’t sour. Not even sure these would really be considered sour in 1985, the advent of true sour-ity with the introduction of sour patch kids. 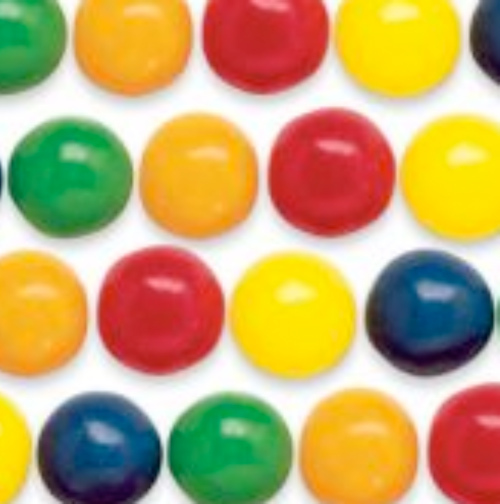 Plus, Jelly Belly’s Fruit Sour flavors are oh-so-very average. We got lemon yellow, old-school-grape purple (which is my fave and tastes just like Alexander the Grapes now called Grapeheads), I-think-it’s-cherry red, it’s-apple-but-tastes-nothing-like-it green, and triaminic orange. Dare I say disappointing. And here’s why: Jelly Belly makes jelly beans that are unmatched in flavors. When you eat a cappuccino jelly bean, you know it. Yet, with these balls, if I close my eyes, it takes a few secs to determine that that’s a red one I popped in my mouth and I still don’t know if it’s cherry or strawberry. I’m not positive but I think sexi Lexi said these balls needed to be cooled for better results. I’m not going to argue the power of cold candy, and I regret I didn’t keep mine in the fridge…but that isn’t going make someone like these if flavor is important to them. My suggestions for Jelly Belly: use your flavor expertise and infuse it in these things. Plus either change the name or go more sour, and I’d prefer you go the latter. Once you got that going on, gimme call and lets get you all a better review. Matty gave me a few to sample, and while they’re enjoyable, they’re just not that memorable. FAR FAR better are the “Chewy Lemonheads & Friends” assortment you can get anywhere these days. Miles better. I completely agree with the details of your review Matty, but I still just LOVE the Fruit Sours. I don’t claim that they’re super sour or chewy or that the flavors match their color or are accurate to the fruit that Jelly Belly has chosen to associate with them. I just love them! I’ve never cooled them so I don’t know if that would increase my pleasure in eating them, but I do love to work off the shell first and then eat the jelly part. Sorry you didn’t enjoy them but thank for trying and reviewing them. Please send all extras to me! ok when the inventor of the best Jelly Bean ever, comments on your candy blog, it’s awesome. It’d be like if we wrote about the SF Giants and Tim Lincecum wanted to know if we’d like to see his new slider. David – I’ll send you a note from your site. We’d love to review your latest. oh and I Love the trailer. Let me know when it’s out and we’ll review that too ! Full disclosure — I work for Jelly Belly. Good suggestions btw. Fruit Sours are actually a throwback to the pre-super sour days when sour candy was a rare novelty. Jelly Belly has been making them since the 1960s or so. They are the grandmas and grandpas of the sour world. More for folks who don’t want to be blasted out of their chairs but like a little tartness. Will go back to the web guys now and see that they eat a few Fruit Sours to see if any tears come to their eyes. Oh and Goelitz is the family name — the 4th, 5th, 6th generation of Goelitz family still making candy and still running Jelly Belly Candy Company.